Allowing you to scout smarter, not harder. The real game changer. eScore measures the number of days that have registered a sale in the past 180 days. This gives you a better insight into the book’s historical demand. eScore prevents you from getting tricked by a book’s volatile sales rank, and eliminates the need to analyze additional charts. When you discover multiple quantities of the same book, eScore provides the data you need to know how many to put in your cart. This key metric is available in database mode and provides the backbone for our Smart Triggers. If your current triggers only allow you to analyze a single data point, you’re most likely leaving piles of money on the table. More than 50% of books on Amazon don’t have a Prime price “visible” to scanning apps (thanks to Amazon’s API limitations). ScoutIQ analyzes multiple variables to help you select a realistic list price – including visible Prime prices, all Used prices, the Used Buy Box, and Amazon’s price. Once the app selects a list price, it then deducts shipping expenses and Amazon’s fees to arrive at an estimated net profit. This profit-based approach is built into our Smart Triggers to help you focus on growing your true bottom line. Whether you sell Merchant Fulfilled or FBA, you can customize ScoutIQ’s triggers to meet the precise needs of your business. Serious book scouts require a downloadable database. Database Mode helps you scan books up to five times faster than looking up live data. Time is money in this business. Having offline access to data allows you to scan books in areas without cell service or a WiFi signal – such as that thrift store in the boondocks or that library sale in a dusty basement. Go where others can’t. ScoutIQ’s database updates twice a day to give you up-to-date pricing information, and we packed it full of relevant data – including the book’s weight, Amazon’s Price, the Used and New Buy Boxes, the Trade-in Value, and of course our secret sauce – eScore. 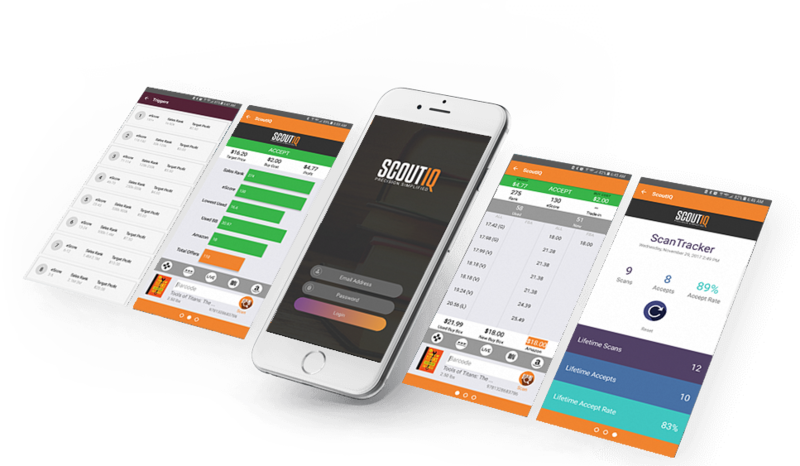 Keep tabs on your scouting achievements with ScoutIQ’s Scan Tracker. Reset the “trip odometer” daily, weekly, or before that big library sale. Now you can accurately measure the quality of your sources by analyzing your accept rates. Track your speed to see just how many books you can scan in an hour. Know exactly how many books are in a gaylord and what percentage are worth listing (stop guesstimating!). Compete with your friends locally, or post screenshots on social media to discover who is truly the King or Queen of the book scouting world! Who said book scouting wasn’t fun? Find any product on Amazon in a variety of ways with ScoutIQ. Use the built-in custom keyboard to type in ISBNs or UPCs, and use the QWERTY-style keyboard to do a title search to find products without barcodes. If you don't want to manually type in barcodes, you can use your phone's built-in camera or pair your phone to a bluetooth barcode scanner to speed up the searching process even more. ScoutIQ can now look up any item on Amazon with a barcode! Books, CDs, DVDs, Toys, Games, Vinyl, Electronics, etc... No barcode? No problem! You can also find products with a title search or an ASIN search. Sales price doesn’t matter… bank deposits do. ScoutIQ's triggers are focused on the bottom line. New books are being published all the time, and with your help we will capture these new ISBNs and add them to our database. Here’s how it works: If a book isn’t in our database, we can look it up live and show you the results so you don’t miss a beat while scouting (use Data + Live Mode), and then we add it to our database so you won’t have to look it up live next time around. Pretty cool, eh? Thanks for helping the book community have access to better data. P.S. Feel free to send your friends an invoice for hooking them up! Quickly identify books with a guaranteed buyback price, even in Database Mode. Reach out to our helpful and knowledgeable US-based team via chat, email, or through Facebook. Measure your results, find your best sources to hit them early and often.